Brandon McCarthy, right, and Bronson Arroyo of the Arizona Diamondbacks. The Arizona Diamondbacks are off to a pretty bad start this season. In fact, it’s been downright wretched: Their 4-14 record ties them for the second-worst 18-game season opening of the past 11 seasons (since 2003, when the Detroit Tigers started 1-17). Putting aside who or what is to blame (hint: not their Australia trip), take another look at that 4-14 record. Also note that the Diamondbacks were 4-12 through 16 games. By Major League Baseball standards, these are notably bad records. But in football, a 4-12 record happens with some frequency. Last season alone, seven NFL teams went 4-12 or worse. Ever since the NFL expanded its schedule to 16 games in 1978 — excluding strike-shortened seasons in 1982 and 1987 — 14.5 percent of all teams have won four or fewer games in a season (throwing out teams who had ties). Similarly, over the same range of seasons (1978-present), an even 13 percent of NBA teams began their schedules with a 4-12 mark or worse. By contrast, only 4.3 percent of MLB teams have started the season 4-12 or worse over that span. This underscores two of the major differences between baseball and other sports — the relative compression of team records and the lack of information conveyed in any single-game result. Baseball famously plays the longest schedule (by far) out of the four major North American professional sports, a 162-game sample size which naturally reduces the presence of outlier performances. But as we saw above, even within a smaller chunk of games, baseball teams have more difficulty pulling away from the pack. This goes back to research I conducted two years ago, comparing the NBA’s season structure to those of other sports. Using an unbelievably useful methodology from arch-sabermetrician Tom Tango, I calculated the number of games necessary in each sport to regress a team’s record halfway to the mean — meaning, we’d know half of its observed outcomes were due to its own talent (while the other half results from randomness). For pro basketball and football, the numbers are similar: In the NBA, it takes about 12 games; in the NFL, 11 games. But in baseball, it takes a whopping 67 games for half of the variance in observed winning percentages to come from the distribution of talent and half from randomness. 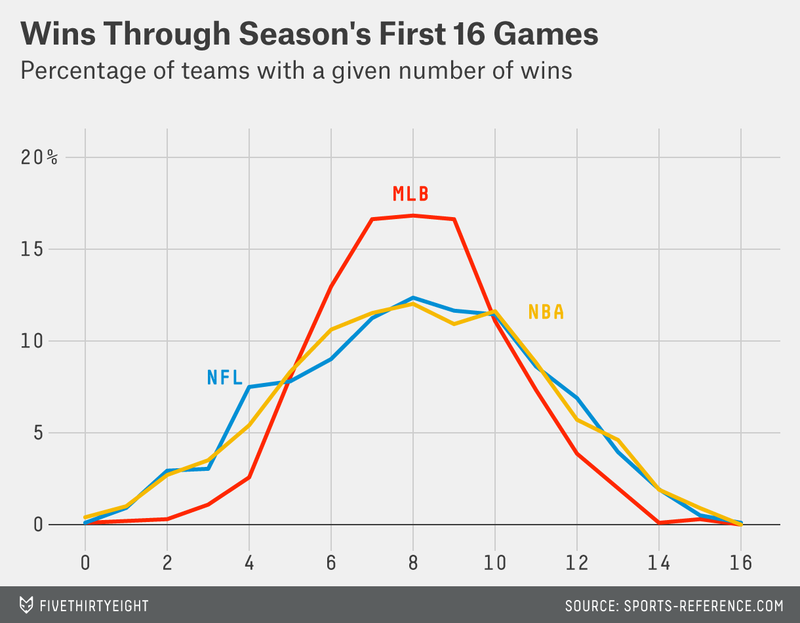 This matches up with what we saw in the data on 16-game starts to each sport’s season. The NBA and NFL are very similar in the spread of records in a given x-game chunk, meaning the amount of information conveyed by any result is close to being the same in each sport. But MLB is a different animal. Its long season sets it apart, but even within the season, baseball teams are bunched together much more closely than their counterparts in football and basketball. CORRECTION (April 17, 3:29 p.m.): A reader pointed out that an earlier version of this post (which said the Arizona Diamondbacks’ 4-14 record tied them for the worst 18-game season opening of the past 12 seasons — since the 2002 Detroit Tigers started 3-15) was incorrect. Indeed, the 2010 Baltimore Orioles started 2-16 and the Tigers went 1-17 to start 2003. We’ve updated the post.